In a skillet over medium-high, heat oil and saute garlic for 1 minute. Add salt and spinach, saute 3 minutes or until spinach wilts. Place mixture in a colander and press with the back of the spoon until the mixture is barely moist. In a food processor, add spinach mixture, basil, cream cheese, yogurt, Parmesan and pepper. Process until smooth. 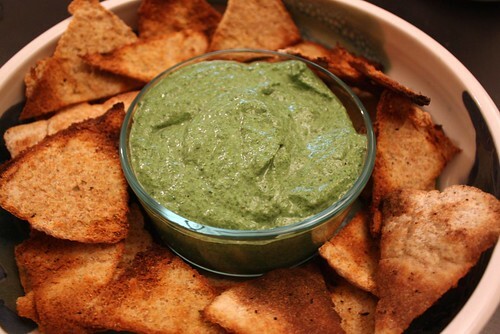 Serve with homemade pita crisps. To make Pita Crisps: Cut whole wheat pitas with kitchen scissors into 8 slices. Brush with olive oil and sprinkle with garlic salt. Broil for 3-4 minutes until toasted. Be careful to watch them so that you don't burn them!